TheBikeBuyers.com, the place to go to get cash for motorcycle, just launched its website the company announced today. For years customers have been able to sell their unwanted motorcycle with no hassle now, the site makes it more convenient to find out motorcycle worth and sell that damaged motorcycle. For 25 years, TheBikeBuyers.com has focused on buying unwanted motorcycles. TheBikeBuyers.com buys motorcycles in any condition and any make and model between the years 1997 and 2010 as well as classic bikes from any year. The company has been buying unwanted motorcycles for 25 years and has earned a reputation for offering top dollar for unwanted motorcycles. Now with the website launch getting cash for motorcycle is an even simpler process. Simply visit the site, click on the Get a Quote link, negotiate a price for the vehicle and then schedule a time for a TheBikeBuyers.com agent to pick up the bike and pay cash that same day. Chris Shaw, president of TheBikeBuyers.com said the website offers yet another option for motorcycle sellers to quickly get cash for their bikes. “The process of selling a bike to TheBikeBuyers.com has always been easy but we decided to add the website in order to provide yet another option. The website makes the process a little more streamlined and a lot faster for someone wanting to sell their bike for cash,” Shaw said. TheBikeBuyers.com buys motorcycles, choppers, scooters, sport bikes, jet skis, sport touring, dual sport, dirt bikes, ATVs, Harley Davidsons and custom trikes in any condition. It’s the fastest way to sell a bike quickly with the best service and receive the best possible price. Selling a damaged motorcycle by conventional means takes a long time and may leave a seller wondering “Will someone buy my motorcycle?” TheBikeBuyers.com will buy that motorcycle. TheBikeBuyers.com are one of the largest wholesalers in the U.S. with numerous locations across the country, motorcycle sellers can either drop off their bike for cash or they can have one of TheBikeBuyer.com’s agents pick up their bike for free. 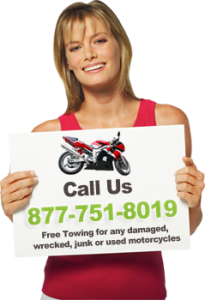 TheBikeBuyers.com agents can conveniently pick up that damaged motorcycle in any location across the country. TheBikeBuyers.com’s agents are professional and courteous and can pick that bike for free no matter where it’s located. For motorcycle owners asking themselves “Where to sell my motorcycle?” Stop wondering and visitwww.TheBikeBuyers.com or call them at 877-751-8019. Get an instant evaluation and get cash for a motorcycle.